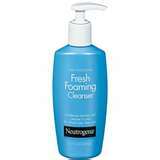 This is my fav facial cleanser. I've been using it for about 2 years now. I try other things but I ALWAYS come back to this. ..................for very obvious reasons Destinee. I love this cleanser myself. I just discovered it!!! !